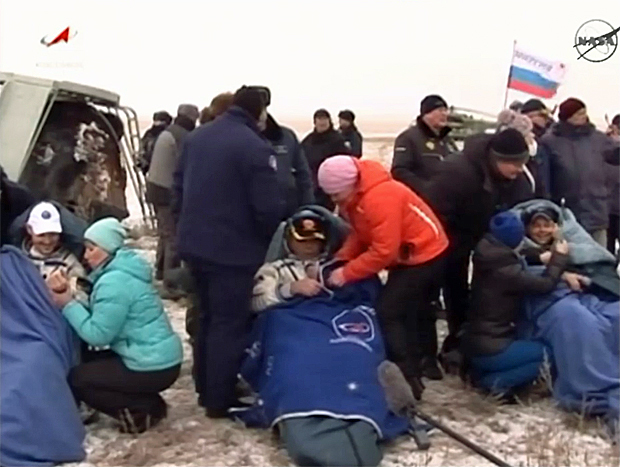 A veteran cosmonaut, a German volcanologist and a Navy test pilot-turned-astronaut whose mastery of social media earned him -- and NASA -- a global following, undocked from the International Space Station and returned to Earth Sunday, descending through low clouds to a jarring parachute-and-rocket-assisted touchdown on the frigid steppe of Kazakhstan to close out a 165-day stay in orbit. "Here we have (Russia), Germany and the U.S., we've worked together for half a year," Suraev said. "Everything was fine, everything was in the spirit of cooperation. So I think everybody needs to learn and follow the example of ISS crew members -- don't get insulted, don't try to prove anything to each other, let's try to live together, side by side." 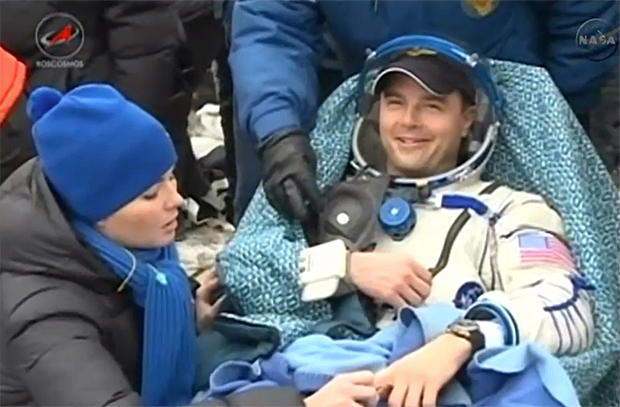 Left behind in orbit were Expedition 42 commander Barry "Butch" Wilmore, Alexander Samokutyaev and Elena Serova. They will have the station to themselves until Nov. 23 when Soyuz TMA-15M commander Anton Shkaplerov, NASA astronaut Terry Virts and European Space Agency astronaut Samantha Cristoforetti arrive to boost the station's crew back to six. "They say this is the most complex machine that humanity has ever built," Gerst said Saturday, floating with his crewmates in the Japanese Kibo lab module. "Now, even after half a year on board, it is impossible for me to fathom how complex it is to actually operate this machine. What I'm sure of is this is the finest example of teamwork that I've ever seen in my life. I'd like to say thanks to all the ground support teams, all those people who dedicated all those hours of work to us." Wiseman became a rock star of sorts during his stay in space, using Twitter, six-second Vine videos and other social media avenues to share his experiences -- and spectacular views of Earth -- with a wide audience: 361,000 followers on Twitter alone. "This is my first spaceflight, and I just wanted to share some of the newness, some of the uniqueness of this environment," he told CBS News in an interview last week. "And I think we've been successful with that. I think the Vines, putting this imagery in motion, has really captured the imagination of a good number of folks. And that was my goal, was to use that imagery, put it in motion, and let people try to experience this, let them try to live this with me. For that, I think it was great." Gerst posted frequent Tweets as well, including this one Sunday: "Thanks to all of you for flying to space with me, it's been a blast. I am glad we did this together!" "I think the biggest thing I'll take away from this is watching our Earth change over the six months I've been up here," Wiseman said, "watching the weather patterns change, seeing summer, fall and now into winter, it really makes you realize we don't just live on Earth, Earth is just a part of all of us. I really love looking out the window at that. But he clearly looked forward to coming home and "hugging my wife and kids, that's number one." "And then just being able to select the food that I want to eat," he added. "The food up here is actually pretty good, but (after) six months it'll be nice to be able to just get in the car, drive to the store and grab whatever I want and then having my kitchen at my disposal to make some good food." He's also looking forward to simply sitting down. "I haven't sat down in 160 days and just that feeling of sitting down and having gravity pull me down onto a chair, I'm really looking forward to that," he said. 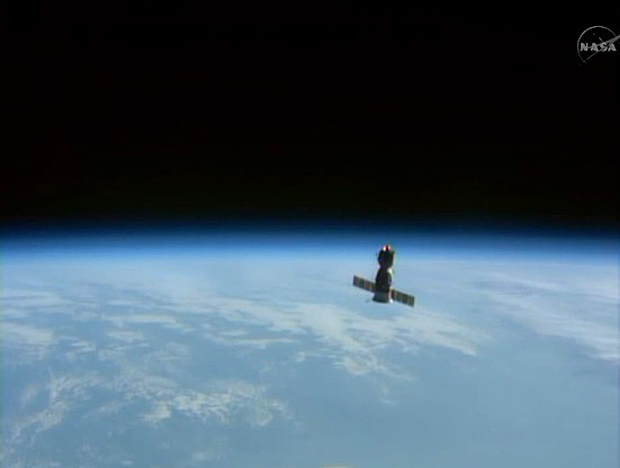 The trip home began at 7:31 p.m. when the Soyuz TMA-13M spacecraft undocked from the space station's Rassvet module as the crew sailed 260 miles above northern China. "I'm going to miss the work," he said. "Really, the work up here, I didn't expect this, but it turns out it's actually really fun. I love doing the science, I love working with the team on the ground. So from the start to end of my day, I'm going to miss it all." Near the end of his stay in space, two dramatic failures sent shock waves through the commercial space industry. An Orbital Sciences Antares rocket carrying a cargo capsule bound for the space station exploded 15 seconds after launch from Wallops Island, Va. on Oct. 28. Three days later, Virgin Galactic's SpaceShipTwo rocket plane broke apart during a test flight over the Mojave Desert, killing one pilot and injuring another. Wiseman said he had friends at both companies "and that touches me pretty closely." "The great part about this industry is, it will be better at the end for both of these mistakes, or mishaps, and we'll pull through. ... We'll figure out what happened, and if it's the correct time we'll fly again, both of these vehicles, and if they determine that they can't, then we'll look for other options down the road. This is a setback that happens in this industry, and there will be recovery, there will be healing, and then there will be success down the road."